Preface: I have been reviewing Esmé Boyce’s dance and choreography for years, and before that I’ve even collaborated with her. For the past two years, however, we have both taken slight detours out of New York to travel and get Master’s degrees. Hers was an MFA at the University of Wisconsin, and it is almost over now. She made a return to the NYC stage this spring with a showcasing at the Baryshnikov Arts Center, which included her own thesis, two other pieces by Nancy Meehan (a creative predecessor) and Catherine Tharin (a creative contemporary), and finally a Q&A with the audience. Before the lights dimmed, Esmé ran out onto the stage. She spoke a few words about the program and the creative background for the pieces we were about to see. I can’t remember every detail, but I can remember a few qualitative descriptions such as “deer jumping in front of headlights,” “spying on a person in a window,” “glints of gold,” “dance beyond words,” and “the idea of using the body for spatial massing.” To tell you the truth, I am certain that those are not the exact words, but I use quotation marks anyhow because Esmé had planted those seeds in my head. Surely enough, those seeds germinated during the performance of Title Comes Last. It is a continuous, roughly 20-minute quintet, transitioning smoothly between several parts, much like her previous pieces. 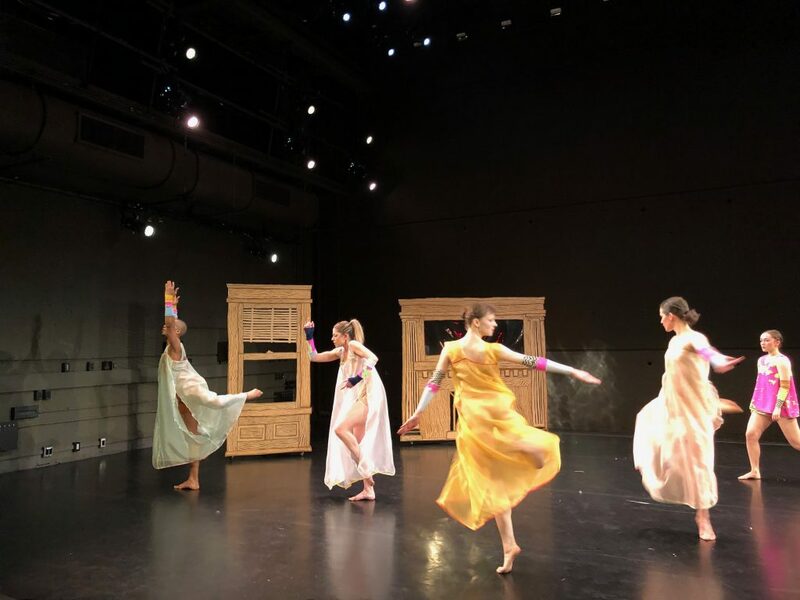 Each dancer underwent one costume change: from a furry pillowcase covering only the torso to a thin full-length nightgown and colorful wristbands. 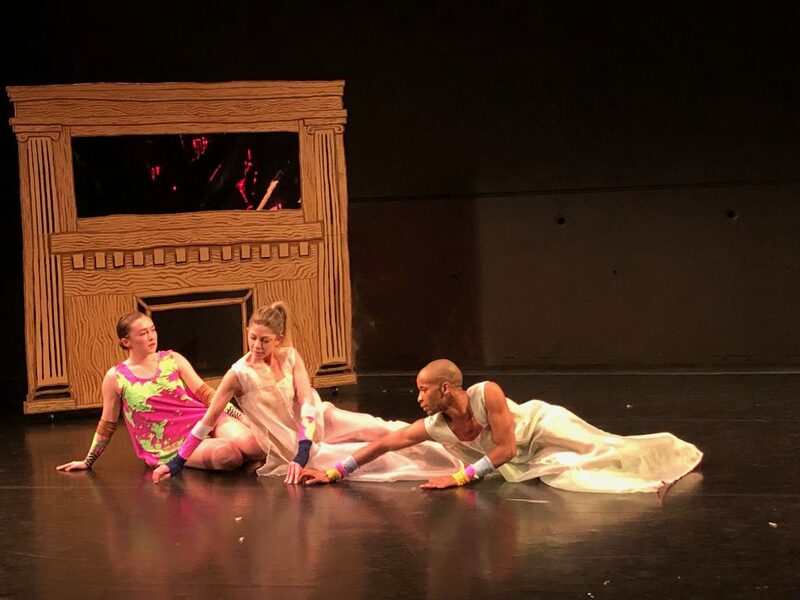 Three cartoony fragments of a room (a fireplace, a window, and a mirror) made up the set, and the music (composed by Cody Boyce and Eleanor Hovda) buzzed and droned throughout, with a few moments of precise silence. The dancers utilized the whole stage, moving into the space behind the set pieces, or crawling slowly on and off stage (i.e. under the bleacher seats where the audience was). Esmé’s choreography has always reminded me of newborn animals learning how to walk. One can easily pick out repeating moves and motifs, the most memorable of which are intentionally abrupt and awkward for a human to perform. They’re not exactly inhuman – but watching the dancers in that moment makes them seem like trained professionals and androids and aliens all at once. One signature move in Title Comes Last goes like this: all of the limbs straighten down to the tips of the digits and spread to just beyond shoulder width, then two arms and one leg flap twice in quick succession like a bird that’s falling asleep and experiencing hypnic jerks (Esmé would explain during the Q&A that her choreographic antennae are always active, receiving inspiration from any possible source. To wit: this move was inspired by the jerky movements of her pet cat). What was new this time, though, was a unabashed playfulness. Dancers often looked each other in the eyes and smiled. A few small sections were reminiscent of games we all used to play in our childhood, like Red Light Green Light, or when we would dance along to Billboard Top 40 music videos. The combination of the alien, the animal, and the toddler brought to mind The Blue Man group. Meanwhile, the three set pieces pulled my mind to some obscure Upper West Side studio overlooking the Hudson River, the sun going down over it. I thought of many unproductive late afternoons that I had spent lying on my back, staring up at the ceiling, watching the dust dance around. I wondered what my own clothes did in the house while I wasn’t wearing them. I recalled when, as a kindergartner, my friends and I would build stages out of chairs and books and reenact famous movie scenes for each other – and how, in grade school, those shows had been replaced with contentious games of Red Light Green Light on city sidewalks. All of this – the cosmic, the physical, the metaphysical, the natural – is contained in the movements which Esmé has ultimately pulled out of the world. 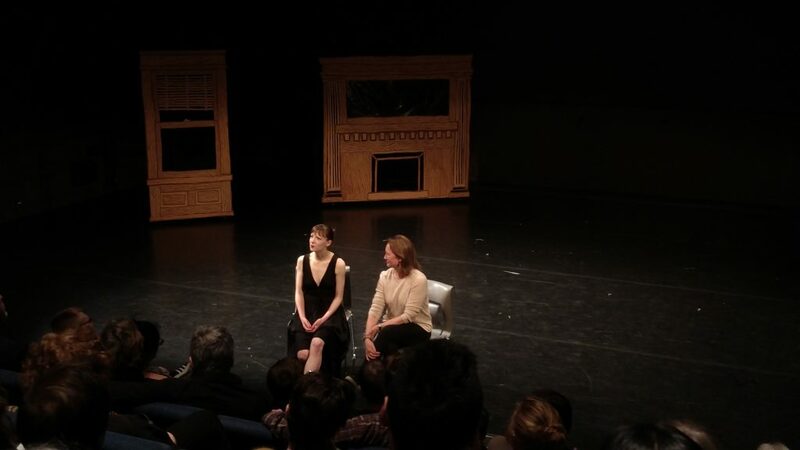 The performances were immediately followed by an informal on-stage Q&A with Esmé and Catherine Tharin. There was maturity in that unguardedness. Perhaps it was simply necessitated by the fact that this was a thesis developed in graduate school, but it’s amazing how a change of setting can transform one’s perspective and willingness to change up the format. I had personally always fantasized about breaking the fourth wall with all sorts of choreographed dancer-audience interactions during a performance, but those are always risky. Here, a simple conversation opened the work up even further, by explicitly making interpretation and audience dialogue an active part of the creative process. Another seed germinated. It was “dance beyond words.” Once, many years ago, I gathered the courage to tell Esmé that she needed a writer. At the time, her dances had always seemed too abstract. Watching them was a constant brain exercise. What cipher would unlock the hidden patterns? I struggled to find out “what was the artist trying to say,” as the adage goes. Instead of effortless stimulation (which is what I thought was the ideal way to experience art), I felt like I was rubbing my eyes, waiting for those electric green shapes to appear on the inside of my eyelids. Why not just give a hint of a story, a place or a person, something more real for the audience to grasp onto? After the Q&A, we went for food at Gotham Market, and my friend Cat told me about how she had started hiking again, and that staring at nature is scientifically proven to be a healthy kind of stimulation for the brain: not singular like a screen, nor chaotic like a crowd. Healthy stimulation is the difference between constructive and non-constructive observation, and it’s why staring at nature is so good for us. Esmé’s dances, I realized, are like that. They are like fields, or clouds: very homogeneous at first glance, but intricate under closer observation. Most importantly, however, there is no cipher, no deep structures to unlock. They don’t demand one interpretation over another – they assure you that all interpretations are OK. Establish a structure and stick to it. Everything is fair game for inspiration. Reference without quotes; homage without naming. Bodies can “mass space,” bodies can make architecture. Abstraction is not a dead-end street, it is a balancing act. Oddly enough, at the end of all this, words and figuration played an integral part in Title Comes Last by design. It may have come naturally because the academic environment broadened Esmé’s perspective (education is good, folks). But the results were greater than any dance piece could achieve on its own. If she was ever tentative about using them as creative tools, she can rest assured that words and figuration do not detract from the power of abstraction. On the contrary, they can all blossom in coexistence.